Dons' Russ Spiers gets to grips with Hull's Ratu Naulago. 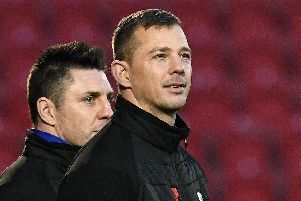 Doncaster RLFC head coach Richard Horne, who is also part of the Hull FC coaching set-up, could be excused for having mixed feelings as the Black & Whites romped to a 72-12 pre-season win at the Keepmoat Stadium. Despite being without several regulars and also losing other key men during the game, Horne will have been disappointed at the margin of defeat and some of Doncaster’s defensive work, but impressed by a Hull side brimming with young talent, new signings and impressive trialists. 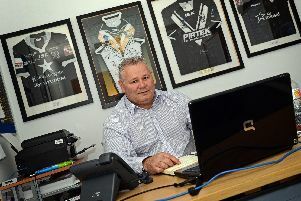 Six members of the Hull squad played for the Dons as part of their dual-registration arrangement with the Super League club last season and given how well they all played Horne will be keen to have as many as possible available for selection whenever the opportunity presents itself this year. Two of them, Hakim Miloudi and Liam Harris, who touched down from the Frenchman’s chip, combined to open the scoring after just two minutes and they went on to play a starring role. With the experienced Dean Hadley showing up well in the forward exchanges, Hull continued to make most of the running and impressive young full-back Connor Wynne also touched during a dominant first quarter. The Dons, for whom local trialists Kieron Lawton and Ryan Dixon both showed up well at times, opened their account when close-season signing Brandon Douglas touched down from close range on 23 minutes near enough for Matty Beharrell to convert to make it 10-6. But they were unable to build any momentum and Hull raced into a 28-6 interval lead with three further tries including a 90m effort by Harris on the hooter. Lawton went close on 42 minutes prior to a long-range converted try by Hull trialist winger Ratu Naulago. Harris completed his hat-trick shortly after with debutant winger Charlie Graham capitalising on a mistake by full-back Sam Doherty as Hull opened up 46-6 lead after 55 minutes. The Dons closed the gap with a close-range converted try by prop Russ Spiers on the hour but that was as good as it got as Hull added a further five tries in the final quarter. Dons: Doherty, Lawton, Owen, Tali, Chrimes, Cross, Beharrell, Spiers, Kesik, Boyle, Foster, Bower, Jones. Subs: Scott, Douglas, Dixon. Hull FC: Wynne, Miloudi, Buchanan, Logan, Naulago, Washbrook, Harris, Fash, Litten, Matongo, Cox, Langtree Hadley. Subs: Nzoungou, Brown, Patterson-Lund, Scott, Lane, Graham, Webster, Atkinson, Bartlett.